A blog chronicling the journey of a lifetime. 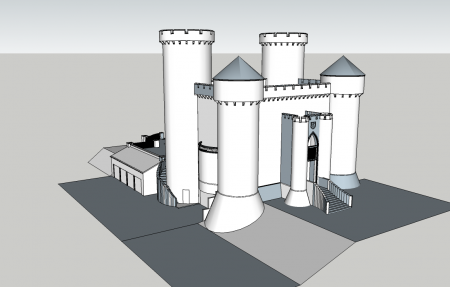 Building a classic gothic castle in a modern era, using modern materials, and energy efficient. 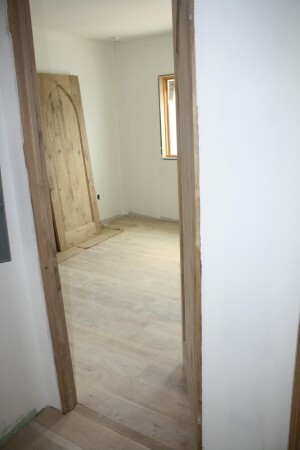 We’ve started flooring the 3rd floor and the kitchen are done. We’ve had other flooring done for awhile now if we consider the tile in the bathrooms but here I’m just referring to the wood flooring. I have around 10,000 sq/ft of wood flooring and that is a pretty big budget line item so I really had to shop around and try to get the best deal on it, using, every dollar per square foot I could save was $10,000 in my pocket. I ended up getting what I wanted from Hardwood Bargains.com Guy V. over there took good care of me, they had good customer service, and were able to get me what I wanted, which because of the quantity and the specificity was a custom run from a mill. 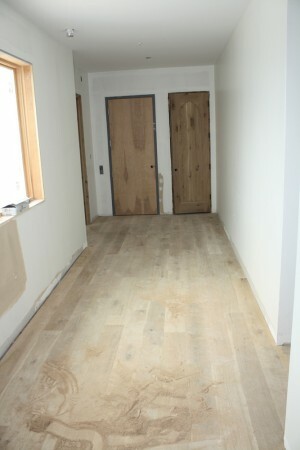 I have 7″ wide white oak engineered planks, character grade with knots and whatnot, lightly wirebrushed, unfinished. Engineered vs solid was a choice to make, in the end it came down to price and availability. The main benefit of solid wood is that it can be sanded a bunch of times, whereas engineered can only be sanded 2 or 3 times. I plan to never sand my floors so that isn’t a benefit at all to me. Meanwhile engineered is cheaper, more uniform, more dimensionally stable, less likely to cup, warp, or twist, and can also better be installed over concrete subfloors, of which I have a small amount. Why unfinished? The plastic/etc coatings on prefinished wood floors are fine and nice and they will never look better than the day they’re installed. They do not look old or antique and they never will, and they’re also quite expensive. 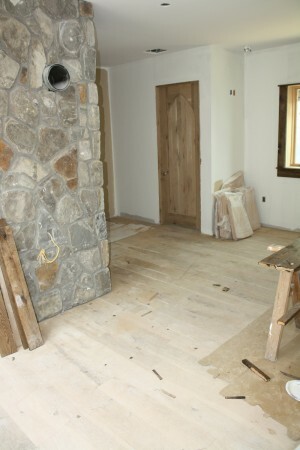 I do not like prefinished floors, some look very very nice, they do, but if they ever get damaged and you want to repair you generally need to sand the entire floor down into the wood. So we’re putting down this wide plank unfinished wood floor, and then we’re applying Watco’s Danish Oil in Black Walnut. This is another product so many have no familiarity with that I really like. It is again something they used to use a lot more often a long time ago and I think it is coming back into vogue. It is a combined penetrating sealer and stain, it both protects and colors the wood, and it does so by seeping into the wood and hardening. It isn’t a top coat, it doesn’t go on top of the wood, so you walk on the wood, not a sheen of something synthetic. So over time the wood gets a little worn and antique looking, which is desirable. You also never, ever, need to sand your floor. If you have any sort of texture on your floor be it hewn or wire brushed you can’t sand it because you’ll remove that texture, but that means you can never refinish if you have a urethane finished floor (something you’d otherwise want to do every 8 or so years). Like the shellac I like for my wood trim, Danish Oil is spot repairable, if you have a damaged spot you just pour more on, let it soak, wipe it off, boom done. No sanding required. It also applies very very easily, unless polyurethane or similar floor finishes where the guy is down on his hands and knees carefully brushing on a smooth finish, you literally just pour this on the floor, and push it around using a squeegee or brush, let it soak, and then wipe it up. I had a guy, who was either giving us the “castle price” or was quoting based on his own lack of experience, tell us $2 a square foot to apply this. Our current flooring installer is just charging us hourly to do it. He did the entire kitchen which is almost 500 sq/ft for $45. What is that 10 cents a square foot? He had never used it before but is now sold on the benefits of the product. It makes a nice floor, colors very evenly, is super easy to use, and has super easy future maintenance and repair. The goal is for my floor to eventually look like an old pub floor you’d find in England that was laid down two hundred years ago, and these products will allow me to get there.